PIERRE, S.D. -- The Museum of the South Dakota State Historical Society, located at the Cultural Heritage Center in Pierre, announces its new affiliation with the Smithsonian Institution in Washington, D.C.
Harold A. Closter, director of Smithsonian Affiliations, announced the new partnership last night at a gathering of legislators, elected officials, members, donors and Gov. Dennis Daugaard at the Cultural Heritage Center during the annual Legislative Reception. In an Executive Proclamation given at a brief ceremony Thursday evening, Gov. Daugaard proclaimed Saturday, Jan. 12, 2013, as “Smithsonian Affiliation Day” in the state of South Dakota. Visitors to the Cultural Heritage Center will enjoy free admission, refreshments, craft activities, presentations and videos from the Smithsonian from 9 a.m.-4:30 p.m. CST on Saturday, Jan. 12. As part of the new affiliation, the museum staff in the Cultural Heritage Center will work with educators at Smithsonian museums to create new educational programming for schools through a distance learning program and for the general public. The affiliation provides the opportunity to borrow artifacts and exhibits from the Smithsonian. Affiliates also have the opportunity to send staff to Washington through the Visiting Professionals Program, as well as seek potential interns from colleges and universities around the state for joint projects. In addition, the new affiliation will bring longer term artifact and exhibit loans to the museum as it begins the task of planning new exhibits and adding new materials to displays currently available at the Cultural Heritage Center. 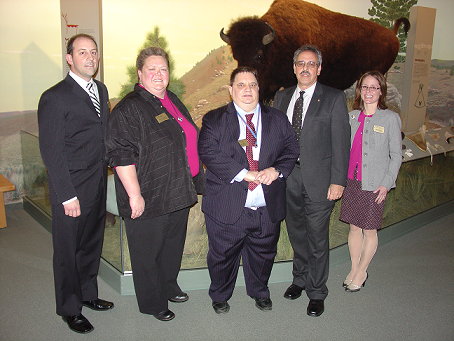 “The Smithsonian name is magical, and it brings with it great opportunity to expand our visitor services and outreach activities,” said Jay Smith, Director of the Museum of the South Dakota State Historical Society, “We are proud of our facility, and now to be associated with one of the greatest museums in the world is a tremendous honor and privilege. Established in 1996, Smithsonian Affiliations is a national outreach program that develops collaborative partnerships with museums and educational and cultural organizations to share Smithsonian Institution resources with Americans in their own communities. Smithsonian Affiliations works with affiliates to enrich communities with Smithsonian scholars, public programs, and professional development opportunities. More information about the Smithsonian Affiliations program and a list of current affiliates are available at www.affiliations.si.edu.